Fifteen and counting…Miley Cyrus got a new tattoo on July 10, 2012 that was inspired by none other than former U.S. president Teddy Roosevelt. Miley Cyrus 15th tattoo is inked on the inside of her left forearm and features a portion of Roosevelt’s “Citizen and Republic” speech, which he delivered at the Sorbonne in France in 1910. Not only is Miley’s Roosevelt tattoo political, but it’s also almost a century older than the former Disney star! Miley Cyrus is the queen of positivity (except when it comes to those pesky paparazzi), which is obvious for those of you out there who follow the singer/actress on Twitter. Earlier this week, Miley tweeted this message: “Putting that positive Monday energy out there…LET’S BE SUPER HEALTHY THIS WEEK. That’s my focus.” She continued, “Everyone should pick up some super healthy snacks this week, maybe give up a vice, only give your energy to positive people in your life!” And if that isn’t enough proof of her positive attitude, check out Miley Cyrus’ peace sign tattoo, or her “karma,” heart and equal sign finger tattoos, the Om ink on her wrist, or the “love never dies” tat on her arm. This is just a guess, but we’re going to go ahead and assume that Miley Cyrus’ fiancée, actor Liam Hemsworth, may have something to do with her “super” happy and positive attitude, and he is probably also the inspiration for many of her tattoos. 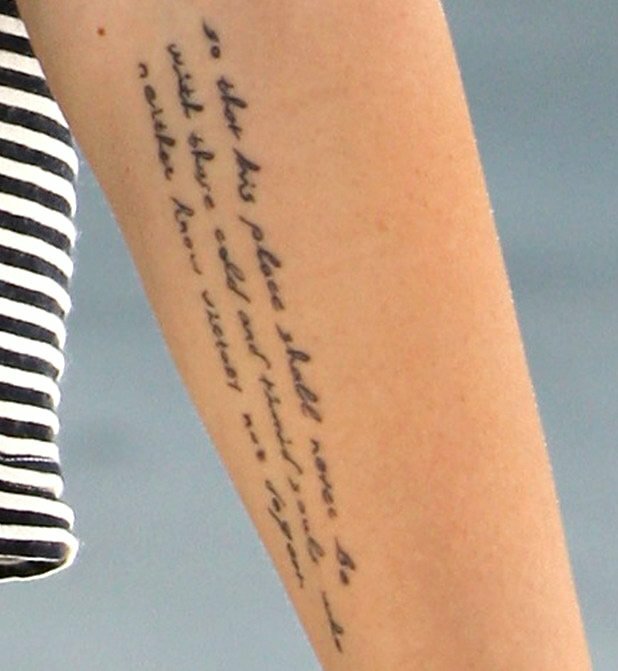 Miley Cyrus Roosevelt quote tattoo is her fifteenth, and we think it’s a pretty solid bet that it won’t be her last!